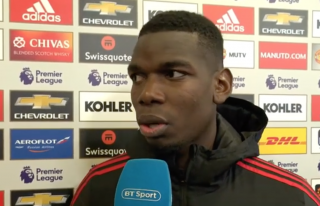 Man of the match Paul Pogba stressed that securing three points mattered most as Manchester United battled to beat West Ham 2-1 at Old Trafford. The Frenchman struggled to explain if the players were tired after Wednesday night’s Champions League first leg against Barcelona. He agreed that United had the luck today and that we’re still in the race for a top-four finish. It wasn’t a Manchester United performance by any means, but we definitely deserved to win. How could you say otherwise when United scored from two stonewall penalties while West Ham only managed one goal? Watch Pogba’s interview with Sky Sports below.